The Conventional Series DC Electric Scissor Lifts offer high capacity and large platform areas, making them suitable for any on-slab application. Featuring variable speed rear wheel hydraulic drive, the Skyjack 4626 offers working heights up to 9.9m and 30% gradeability. Boasting an industry leading 545kg capacity, the SJIII 4626 also features a stowed height of only 2,0m with the rails down for easy transport and access through some low overhead doors. A standard 1.2 m roll out extension deck can be secured in multiple positions, and can be driven at full height. 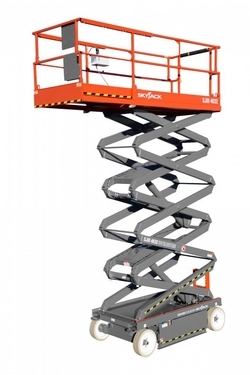 Consistent with Skyjack’s robust and reliable design features, the Conventional Series DC Electric Scissor Lifts utilize Skyjack’s standard colour coded and numbered wiring system with analog based controls.